His eyes follow you around the room! It’s true. They do. I swear. of his jolly pink face. You’ve arrived at the far window, twenty-five feet and a 90-degree angle from where you began. Now turn and cut a glance back through the rays of sun slanting through on this mid-December afternoon. There: His eyes still bore into yours with that weird, glassy gaze – watchful, willful, black as cold marble. No matter where you stand, he’s always there, marking you with that reproachful look and his own creepy conception of holiday mirth. For he is Collectible Santa, a full eighteen inches tall, and after eleven long months lying face-down in a far corner of the attic, he is out of his storage container and here to haunt me again. How do we know he’s collectible? Because it says so on the pewter plaque attached to his wooden base. Plus, my wife told me. Decked out in traditional red-and-white finery and bearing a staff wrapped with garland and several unidentifiable species of berry, he was apparently a Santa of highest and most handsome rank back in 2004. With his stony glare, one foot stepped slightly forward, and holding what looks like a corncob pipe, he could be General MacArthur striding ashore in the Philippines during World War II. And he has friends. You could even call them an army. And more arrive every year, taking up positions in every nook, cranny, and corner of the den – and now, beginning to invade other rooms of the house. Over there on the bookshelf: That’s White Sitting Santa, purchased at a fly-by-night Christmas shop in the mall years ago when we were shopping for an artificial Christmas tree. The alabaster bag of goodies that matches his fur hat and coat keeps falling out of his strangely small and feminine hands. Is he from Norway? The Renaissance? Some other ancient era or part of Planet Earth? Laura says every Santa is timeless and ageless, no matter how he’s dressed. Agreed. But the pointy white boots with the bells on the tips make him look like a court jester to me. Then there’s Tree-Topper Santa with his conical hollow base. Robed in green and burgundy and holding a lantern (or is that something for incense? ), he was apparently designed to adorn the top of an enormous Christmas tree but at some point must have tumbled from the crown and broken his neck. Now, like a stumblebum with wispy, scraggly beard and baleful, thousand-mile stare, his head falls sideways unless you lean him against something. I have always tried to embrace that pearl of wisdom that if something no longer brings you pleasure, you should get rid of it. But when it comes to decorative Santas, I am fighting a losing battle. I protest the entry of new Santas into the house every year, calling them just more stuff we don’t need – like baseball caps, lounge pants, mini-umbrellas, hydrating lotions, coffee mugs, and Children’s Tylenol. But then the family reminds me of my own penchant for hoarding and clutter (used books, unused picture frames, back issues of The New Yorker, an old manual typewriter). 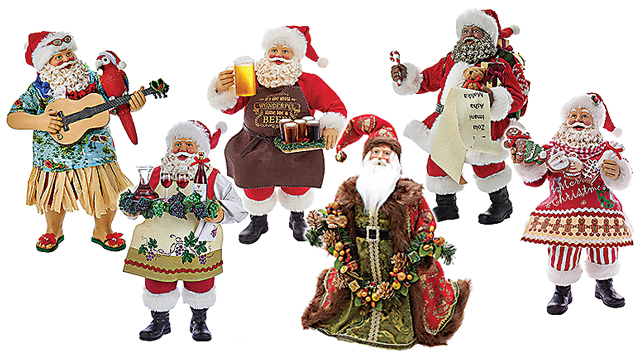 So what else to do but pursue détente with Santas of every shape, type, color and demeanor? Might as well face it: I am surrounded. Behold Target Santa, wise and weary, traditionally clad, presenting a bough of holly and sporting an inexplicable red-and-white bird on his chest that looks like the mascot of a college sports team. Next comes a matched pair of Costco Santas, one with a boy at his side, the other with a girl, bought years ago with the notion that these blank-faced kids closely represented our children as toddlers. Current Events Santa, picked out by our young son at Homegoods about the same time, dresses like a chimney sweep and carries a bag of toys that seem mainly to be rolled-up newspapers. Trapper John Santa wears snowshoes to get his presents to all the world’s children. Roman Imperium Santa is dressed all in gold; my wife, who teaches ancient history, reminds me that St. Nicholas was a bishop as well as a saint. Merlinesque Santa, hailing from a trendy gift shop in green coat and pointy hat, looks more like a warlock than a gift-bearing elf. Consignment Santa came on deep discount because of his bulbous nose, baffled look, and the clamp stuck to his hand that once held some bauble now lost to the ages. And List-of-Names Santa holds exactly that: a long, scrolling list of lucky children that infuriates my daughter because her brother’s name just happens to appear on it but hers does not. Sometimes we dream of skipping town to celebrate Christmas in some faraway place, leaving the Santas in charge of the house while we’re gone. But even in some foreign land, more Santas would likely await us, perhaps wearing the costume of that faraway place and begging with baleful eyes to be taken home and added to our collection. Like Outlander Santa, proudly standing here in a place of honor. Clad in tartan kilt and cap and brooding with romantic intensity, he reminds a certain member of our household of dreamboat Jamie, laird of his Scottish warrior clan on STARZ Channel’s Outlander, whose fur-lined sporran pouch contains his most precious rosary. So what if his feet occasionally need to be super-glued back to his legs? And when the time comes to pack them away for another eleven months, I know Outlander, Collectible, and the rest of our decorative Santas, like hard-eyed, pipe-smoking General MacArthur who made good on his wartime promise, will make one last vow as I close up the box.